Books in the Teaching English Language Learners (ELLs) across the Curriculum Series are written specifically for pre- and in- service teachers who may not have been trained in ELL techniques, but still find themselves facing the realities and challenges of today's diverse classrooms and learners. Each book provides simple and straightforward advice on how to teach ELLs through a given subject area, and how to teach content to ELLs who are at different levels of English language proficiency than the rest of their class. Authored by both language and content area specialists, each volume arms readers with practical, teacher-friendly strategies, and subject-specific techniques. 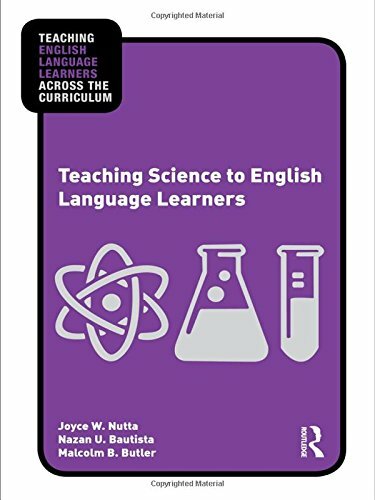 Teaching Science to English Language Learners offers science teachers and teacher educators a straightforward approach for engaging ELLs learning science, offering examples of easy ways to adapt existing lesson plans to be more inclusive. The practical, teacher-friendly strategies and techniques included here are proven effective with ELLs, and many are also effective with all students. The book provides context-specific strategies for the full range of the secondary sciences curriculum, including physical science, life science, earth and space science, science as inquiry, and history and nature of science and more. A fully annotated list of web and print resources completes the book, making this a one volume reference to help science teachers meet the challenges of including all learners in effective instruction. graphs, tables, and illustrations provide additional access points to the text in clear, meaningful ways.